Still steamed about that canceled Cro-Mags show? Bowery Boogie has a gallery of the band rocking out at CBGB in 2006 and Highland Ballroom in 2011. The photos, by Clayton Patterson, capture the raw energy that never made it to the stage on Friday due to an alleged knife attack by Harley Flanagan, a disgruntled founding member of the band. 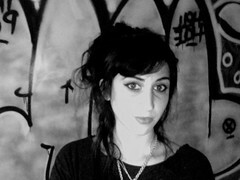 At 23, Jessie Mac is one of New York’s youngest curators. Tonight at 9 p.m., her third show at Gathering of the Tribes, “’93 Til Infinity,” closes with a party featuring a screening of “Captured,” the 2008 documentary about photographer, curator, and local historian Clayton Patterson. The exhibition features Mr. Patterson’s early-90s photos of the Lower East Side amid floor-to-ceiling graffiti work by Mint&Serf of the Peter Pan Posse art collective. Ms. Mac spoke with The Local about working with Steve Cannon, the founder of Tribes who is fighting to hold onto the space. How did you wind up as curator of Tribes? Before today’s May Day festivities kick off, let’s turn the clock back 22 years, to May 1, 1990. 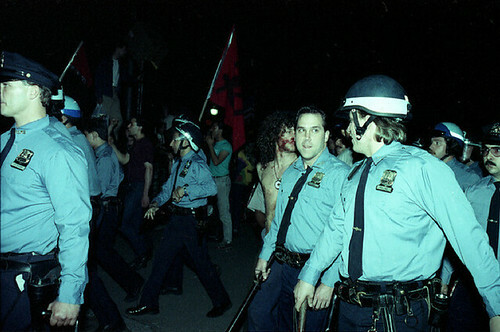 That’s when an affordable-housing festival in Tompkins Square Park ended in a riot in which 28 police officers were injured and 29 people – some of them activists, anarchists, and squatters who had participated in the better known riots two years earlier – were arrested. The hand in formaldehyde, the dusty Styrofoam mannequins and the subway signs for sale were long gone. But last night Billy Leroy and around 200 friends celebrated the now-closed antique shop on the Bowery a final time, raising their beers inside the iconic tent that will soon be six feet under. The love was not in short supply because Mr. Leroy’s eponymous shop on East Houston Street at Bowery, which he ran for 10 years, had to close on Jan. 1. In the place of the store will go a two-story development, though the story isn’t entirely tragic. The tent will be gone, but the landlord, Tony Goldman, has assured Mr. Leroy his store will have a space in the building when complete. By 8 p.m. the tent was at capacity as old friends and the crew from Mr. Leroy’s upcoming film rocked out to the bands The Naked Heroes and The Virgins. Two hours later the funeral bash had spilled out to the sidewalk. Not surprisingly, that wasn’t the only example of gallows humor last night. In case you missed it, President Obama’s motorcade rolled down East 12th Street last night, to the consternation of many. Above, Scott Lynch got a photo of preparations at University Place. 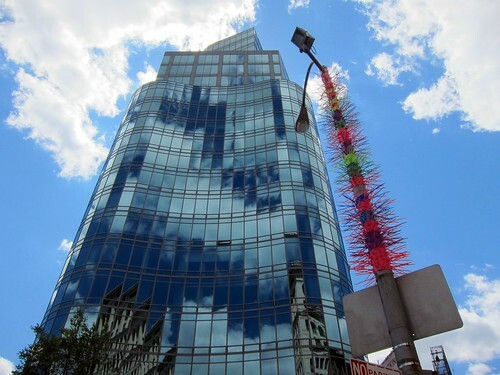 According to City Room, more than 100 Occupy Wall Street demonstrators marched to the president’s next stop, the Sheraton Hotel in midtown, to protest a fundraising event there. Back when The Local spoke to Clayton Patterson about his in-the-works anthology, “Jews: A People’s History of the Lower East Side” (which ended up being successfully funded on Kickstarter), he showed off a mock-up of the “Legends of the Lower East Side” coloring book that he was working on with artists Troy Harris and Orlando Bonilla. The Villager has more about the project, and Bowery Boogie publishes some sample pages. The neighborhood’s renegade documentarian, Clayton Patterson, filed a dispatch from the Occupy Wall Street protests to Bowery Boogie. In a photo essay, Mr. Patterson writes that he snapped pictures of an officer trying to start a fight with protestors as an excuse to lock them up. 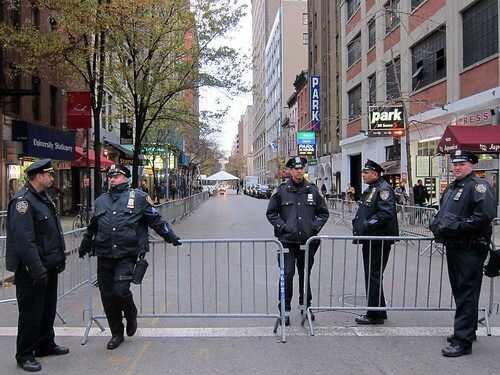 Other shots capture the tension between the police and protestors as Occupy Wall Street approaches its second week. According to DNAinfo and other sites, including NYC.gov’s slow-moving Office of Emergency Management page, parts of the East Village are among the “Zone A” areas most at risk should Hurricane Irene strike Manhattan: “In the East Village, Zone A extends to Avenue D from East 4th Street to East 8th Street. From there, it extends to Avenue B up to 14th Street.” If evacuations are called for, shelters opening at 4 pm on Friday include Seward Park High School (350 Grand Street) and Baruch College (East 23rd Street and Lexington Avenue). Hurricane or no hurricane, the Tompkins Square Park leg of the Charlie Parker Jazz Festival, on Sunday, has been canceled, according to a press release picked up by Brooklyn Vegan. Both the Villager and EV Grieve have the latest on what the Parks Department is doing to fight the Tompkins Square Park rats. NY1 also ran a story, and shortly before 11 p.m. last night, The Local spotted “Inside Edition” filming a segment that a crewperson said would air in about two or three weeks. Neither More Nor Less has photos.